Update Archives | Androidability | Android tips, tricks, and technology for better ability. Gmail just got a new update with a brand new inbox featuring labels, contact images, and indicators for your promotional, update, and social notifications. Additionally, new slide-out navigation makes it easy to access whatever you need when you need it. Google has updated Google+ with the ability to add animated profile picture. This comes hand in hand with some major updates for the Android and iOS mobile apps. Profile pictures can now take the form of animated .GIFs, the Web’s long-term staple for animated images, and work on both the browser version of Google+ and the newly updated mobile apps. So you’ve got loads of apps downloaded and installed on your Android smartphone or tablet but can’t see how to update them. Find out in our how to update Android apps guide. Apps are great but updating them is important. From new levels on your favourite games to new features to critical bug fixes and other improvements it’s a good idea to keep your apps up to date. Facebook recently pushed out a minor update to its Android native application, allowing users to change their cover images from their phones or tablets. The social network also fixed issues regarding the “find friends” prompt and image loading. 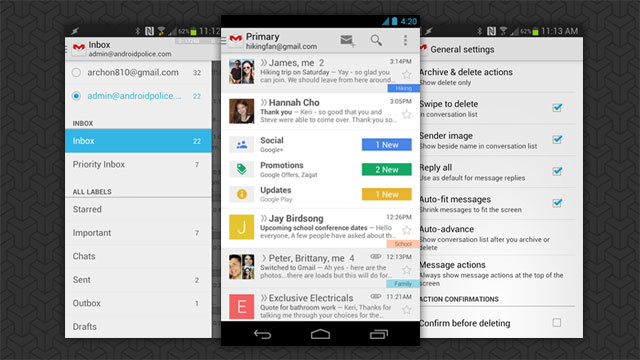 Gmail for Android updated today to let users respond to e-mails directly from push notifications. That’s not all: the update also allows archiving and searching Gmail from the notifications window.